Last Sunday Cambodia held local elections that resulted in a narrow win for the ruling Cambodian People’s Party led by Prime Minister Hun Sen. But while the CPP won the popular vote and will control around a thousand of the country’s 1,600 local councils, the opposition saw its share of council seats increase ten-fold from the last local elections held in 2012. The Friday before the vote, Hun Sen led a huge CPP election rally in Phnom Penh. It was a rare campaign appearance from a leader previously so assured of retaining control that he rarely bothered to campaign in person. But this time around tens of thousands of supporters draped in party flags and donning party baseball caps trailed the prime minister as his motorcade made its way around the capital — a rapidly growing city with a skyline dominated by scaffolding-clad apartment blocks being built. Not to be outdone, the main opposition party, the Cambodian National Rescue Party, emulated the prime minister’s parade later the same day. Both parties’ supporters tailed around the city in convoys about 4 or 5 kilometers long, a cacophony of trucks and motorbikes and loudhailers aiming to get out the vote for the local elections. But the cliché that “all politics is local” has been tested by Cambodia’s local elections — really a dry run for the more important national parliamentary elections scheduled for this time next year. The opposition CNRP won almost half the popular vote last week. That outcome gives it a real shot at winning power in next year’s national elections — a contest that will decide if Hun Sen remains in power and extends his 32 years in office, the 7th longest tenure of any head of government in the world. When Hun Sen first took office, Garret Fitzgerald was Taoiseach and the Anglo-Irish Agreement signed with British Prime Minister Margaret Thatcher was five months away — as was the first meeting between superpower leaders Ronald Reagan and Mikhail Gorbachev. The 64 year old leader is a former Khmer Rouge officer, typically described in western press reports as a “strongman.” He is usually labelled both “wily” and “brash,” despite a recently-acquired penchant for regular bouts of easily-lampooned selfie binges on Facebook. Hun Sen has held power by using a mix of patronage, bribery, threats and violence to supplement his government’s record in overseeing two decades of economic growth at over 7% a year. That expansion has lifted a country ravaged by the brutal Khmer Rouge and another decade of civil war to what the World Bank categorises as a “lower middle income” economy. But the sheer length of time Hun Sen has been in office could be counting against him — whatever about his government’s ability to attract Chinese funding for ports and roads, or to pull in Western garment factory investments that provide hundreds of thousands of jobs. In Cambodia’s previous municipal elections in 2012, Hun Sen’s CPP won over 60% of the popular vote, in the absence of any effective opposition. But that landslide prompted the merger of two smaller opposition parties to form the CNRP, which a year later almost won the country’s most recent national elections. So close did the opposition CNRP in 2013 come that it alleged that was cheated out of a win. The CNRP then boycotted parliament and months of protests followed, with police and plain clothes vigilantes confronting demonstrators. At least 5 people were killed, including striking factory workers that joined the opposition demonstrations. This time there were no allegations of electoral fraud. But even if the vote itself was clean, the campaign period was tense, with government intimidation returning ahead of the vote. 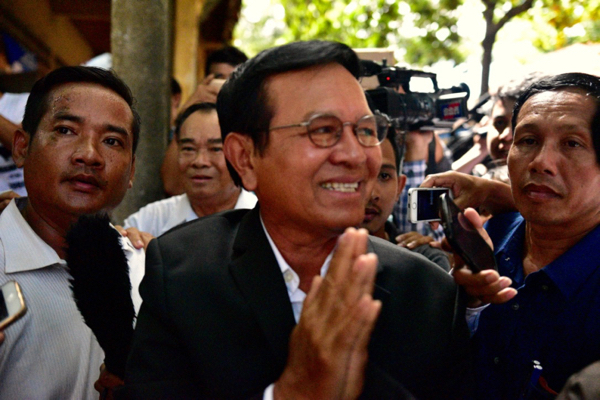 Prime Minister Hun Sen threatened “civil war” if the CPP lost power while former opposition leader Sam Rainsy remained in self-exile in Paris due to defamation charges. But voter turnout was high at 89% and the strong showing for the opposition suggests that the prime minister’s bellicose talk is not scaring voters into sticking with the status quo.